Multiple kinds of data: GPText supports both semi-structured and unstructured data searches, which exponentially increases the kinds of information you can find. Less schema dependence: GPText does not require static schemas to successfully locate information; schemas can change or be quite simple and still return targeted results. Text analytics: GPText supports analysis of text data with machine learning algorithms. The MADlib analytics library is integrated with Greenplum Database and is available for use with GPText. GPText combines a Greenplum Database cluster with an Apache SolrCloud cluster residing on the same set of hosts. The following figure shows the process architecture of the combined Greenplum Database and ApacheSolr clusters. The figure shows four cluster nodes with four Greenplum segments and four Solr instances deployed on each. An Apache ZooKeeper service manages the SolrCloud cluster. Because ZooKeeper requires an odd number of servers, ZooKeeper nodes are deployed on three of the four hosts. Greenplum Database users access SolrCloud services via GPText user-defined functions installed in Greenplum databases and command-line utilities. The figure omits the Greenplum master host, secondary master, and mirror segments for the Greenplum primary segments. The following sections describe how GPText integrates SolrCloud with Greenplum Database and how the two clusters work together to provide parallel text search capabilities in Greenplum Database and maintain high availability. 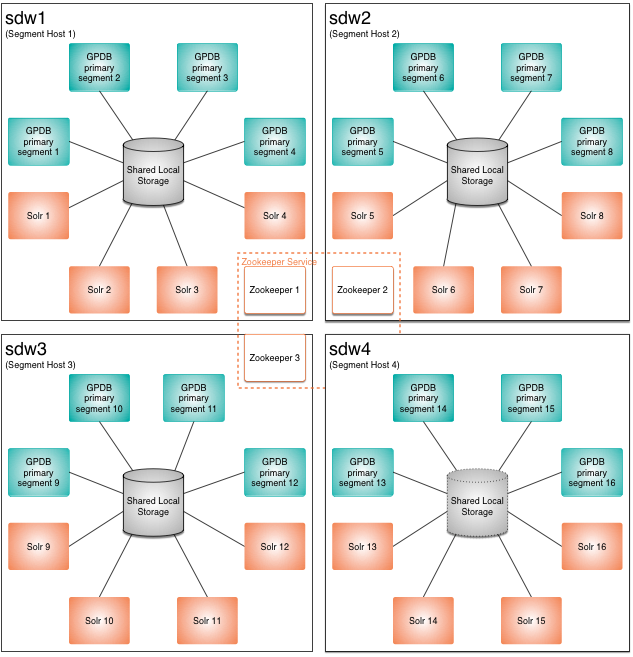 An array of database primary segment instances and mirrors (not illustrated) deployed on segment hosts, by convention sdw1 through sdwn. A segment instance is an independent Postgres database process managing a portion of the distributed data. Each segment has a mirror on another host in the cluster to provide uninterrupted service in case of a segment or segment host failure. The number of primary segments per host is determined by the hardware configuration—the number and type of processor cores, the amount of physical RAM, local storage capacity, and network capacity—as well as availability and performance requirements. The Greenplum master instance coordinates the work of the segment instances. 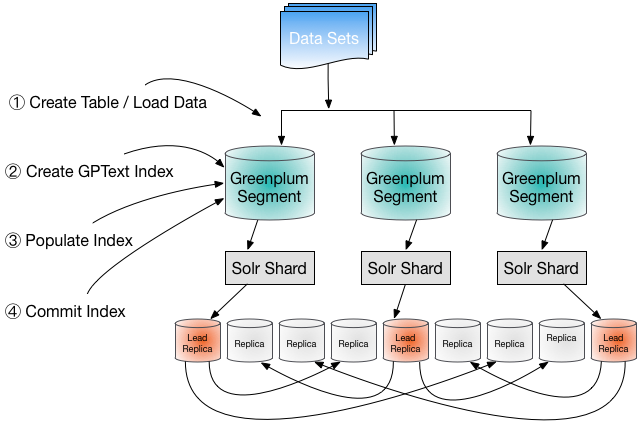 Optimal performance of a Greenplum Database cluster requires that all segment hosts be configured identically with the same number of primary and mirror segments on each, and with the database data distributed evenly among the segment instances. The full capacity of the database cluster is utilized when every segment host performs an equal amount of work. Apache Solr is a server providing access to Apache Lucene full-text indexes. Apache SolrCloud is a highly available, fault tolerant cluster of Apache Solr servers. The term GPText cluster is another way to refer to a SolrCloud cluster deployed by GPText for use with a Greenplum Database system. An Apache ZooKeeper cluster to manage the SolrCloud cluster. SolrCloud uses ZooKeeper to manage server configuration and to coordinate the cluster’s activities. A ZooKeeper cluster always has an odd number of servers. GPText can install a ZooKeeper cluster that is bound to the GPText cluster, or it can share an existing ZooKeeper cluster. If GPText installs the ZooKeeper cluster, it can be managed using GPText functions and utilities. Multiple SolrCloud server instances deployed on the Greenplum segment hosts. Each instance is a JVM process running Solr server. SolrCloud instances use local storage, usually the same local storage volumes that store Greenplum Database data. The number of SolrCloud instances per host can be the same as the number of Greenplum primary segments per host, but this is not a requirement. The number of instances to execute per host is specified during GPText installation. GPText provides document indexing and search capabilities for Greenplum Database by adding user-defined functions (UDFs) that access Solr APIs from within database queries. SolrCloud distributes document indexes in slices called shards. With GPText, the number of shards for an index is the same as the number of Greenplum segments, so each Greenplum segment operates on an equal portion of the index. Each shard is managed by a SolrCloud instance and the shards are distributed evenly among the SolrCloud instances. The SolrCloud instance and Greenplum segment are not required to be on the same host. SolrCloud provides high availability by maintaining replicas of shards and providing automatic failover if a shard fails or becomes unavailable. One replica of each shard is the lead replica and any changes to it are applied to the other replicas. The replication factor, which determines the number of replicas to maintain for each shard, is set when the index is created. Replicas may also be added or dropped later using GPText UDFs or command-line utilities. ZooKeeper determines the locations of shard replicas among the Solr nodes and hosts. When adding a replica using a GPText UDF or command-line utility, a new shard can be explicitly placed on a SolrCloud instance. Load the email records into a Greenplum database. Create a Solr index of the email records. Run queries that look for text strings and their authors. Refine the queries until they pair a dummy company name with top three or four executives corresponding about suspect offshore financial transactions. With this data, the analysts can focus the investigation on specific individuals rather than the thousands of authors in the initial data sample. GPText works with Greenplum Database and Apache SolrCloud to store and index big data for information retrieval (query) purposes. High-level workflows include data loading and indexing, and data querying. The following diagram shows the GPText workflow for loading and indexing data. All client interaction with the system is through the Greenplum master instance. Load data into your Greenplum Database system. Create a database table to hold data and then add the data to the table. Greenplum provides parallel data loading utilities and protocols that help to transform and load external data in various formats and from various sources. For details, see the Greenplum Database Administrator Guide, at http://gpdb.docs.pivotal.io. Create an empty GPText index. Use the gptext.create_index() user-defined function (UDF) to create an empty GPText index for the table. Each Greenplum segment will manage a slice of the index, called a shard. 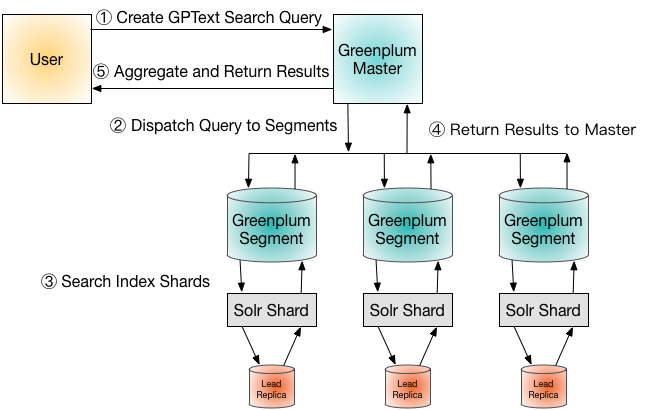 SolrCloud creates multiple replicas for each shard, distributed among the Solr instances, and chooses a lead replica for the Greenplum segment to operate upon. Solr manages replication between the replicas. Populate the index with data from the database table. Use the gptext.index() UDF to add data to the index. This UDF works by dispatching a SQL query to execute on each Greenplum segment. The segments execute the query and add the results to their shards using Solr APIs. Commit changes to the index. Commit changes to the GPText index by calling the gptext.commit_index() UDF. Until the changes are committed, queries executed on the index cannot access any data added to the index with gptext.index(). If needed, uncommitted changes can be rolled back. SolrCloud replicates changes committed to the lead replica to the shards’ non-lead replicas. A user submits a SQL query designed to search the indexed data. A GPText search query is a SQL SELECT statement on a GPText search UDF that contains full-text search expressions. The Greenplum master dispatches the query to the Greenplum segments. Each segment executes the query, using the Solr API to search its index shard. SolrCloud executes the search query on the lead replica for the shard. The Greenplum segments return the results of the search query to the Greenplum master. The Greenplum master aggregates the results from all segments and returns them to the client. GPText enables analysis of Solr indexes with Apache MADlib (incubating), an open source library for scalable in-database analytics. MADlib began as a collaboration between the University of California, Berkeley and EMC/Greenplum. MADlib provides data-parallel implementations of mathematical, statistical, and machine learning methods for structured and unstructured data. You can use GPText to perform a variety of MADlib analyses. Learn more about Apache MADlib (incubating) at http://madlib.incubator.apache.org. A gppkg package for MADlib is available on the Pivotal network at http://network.pivotal.io.